Blessed Trinity Roman Catholic Church is one of the finest examples of 12th century Lombard-Romanesque architecture in the United States. Located at 317 Leroy Avenue in the heart of Buffalo, New York, the edifice is on the National Register of Historic Places. Its unique style makes it stand out from other churches in Western New York. 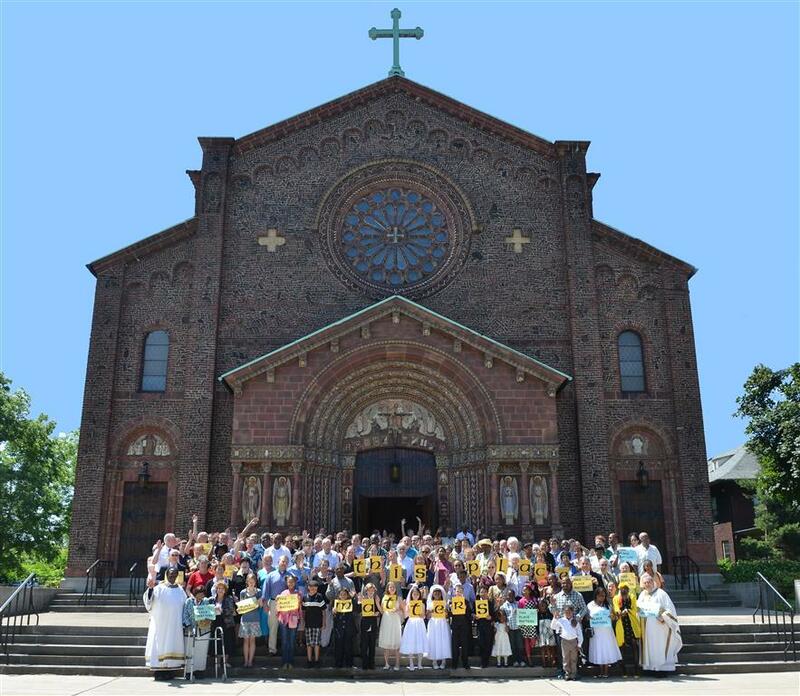 Blessed Trinity Parish was established in the northeast section of the City of Buffalo in 1906. In the early 1920s, the second pastor, Rev. Albert Fritton, wanted to build a new church like those found in northern Italy. He selected Chester Oakley and Albert Schallmo as architects. Construction began in 1923 and the church was dedicated in 1928. When it was completed, the total expenditures amounted to $513,000. In 1976, the replacement cost of the building was estimated at four and a quarter million dollars. Today, it would be impossible to reproduce as it now stands because craftsmen knowledgeable in the various processes used in its construction are no longer available. 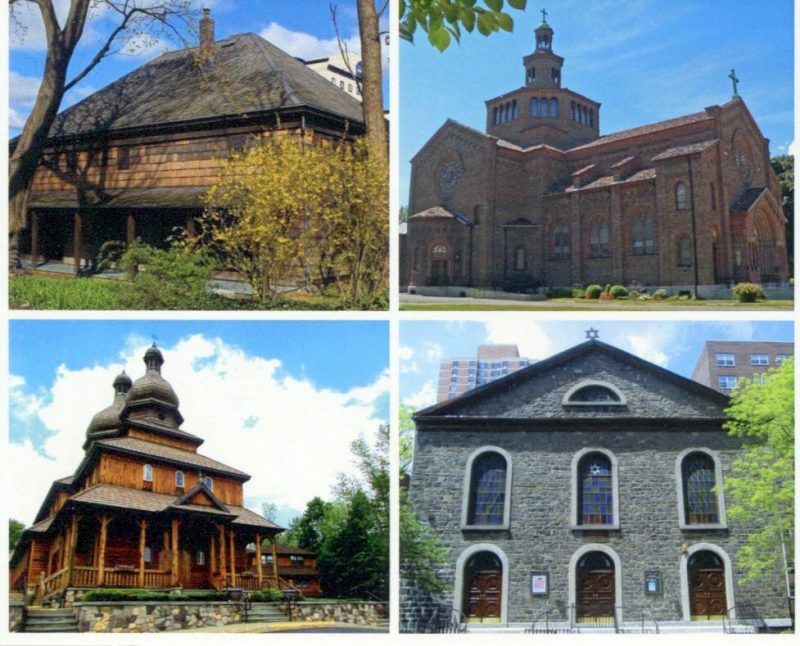 Individuals or groups wishing to schedule tours of the church at other times of the year may do so by contacting the rectory at 716-833-0301 or using the contact form at the bottom of this page. 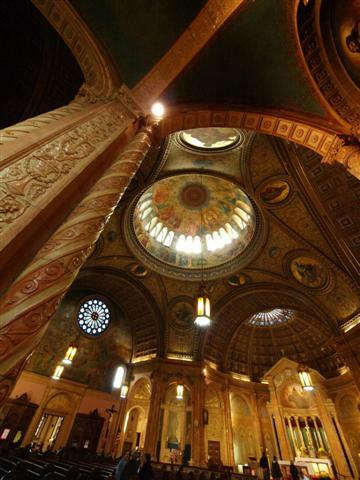 On May 19, 2019, Blessed Trinity will participate in the New York Landmarks Conservancy’s Ninth Annual Sacred Sites Open House Weekend, with our church serving as the “medieval” inspiration for the Conservancy’s 2019 theme: Medieval to Modern: Celebrating New York’s Religious Art and Architecture. Click HERE for complete information about Blessed Trinity’s religious art and architecture and how you can participate in the public tours which are part of this event. The structure is constructed of medieval, handmade, Harvard (unmolded) brick set in a variety of patterns. 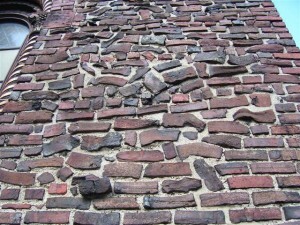 During medieval times, most bricks were made without molds. The clay was mixed with water in a shallow pit, then cut into shape for bricks. After they were shaped and sun-dried, the bricks were stacked for firing. Wood was piled neatly all around the bricks and a fire was kept burning until the bricks were thoroughly baked. The outer bricks were often coal black and the inner ones rich reds and oranges. The medieval method also produced bricks in various shapes, some regular and some irregular. 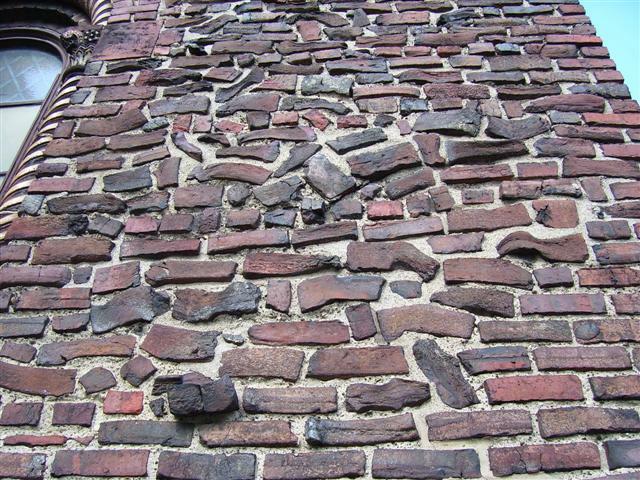 To use all the bricks made, medieval bricklayers used odd-shaped bricks, sometimes working their own patterns here and there into the construction. This same method was employed in the 1920s by descendants of French brickmakers at Exeter, NH, where the bricks for Blessed Trinity were made. Once they reached the church site, they were laid in a thick, soft mortar bed, as in the medieval fashion, which produced a solid bond between brick and mortar. The walls of Blessed Trinity are two feet thick. To produce solid, well-bonded walls, the bricks are often crossed and laid lengthwise into the wall, with the ends or “headers” exposed. Because of the many odd shapes and variation of colors, the 20th century bricklayers were unfamiliar with a method for laying these bricks, so architect Chester Oakley had to provide special training for them. After they learned the technique, they were allowed to work in their own designs. 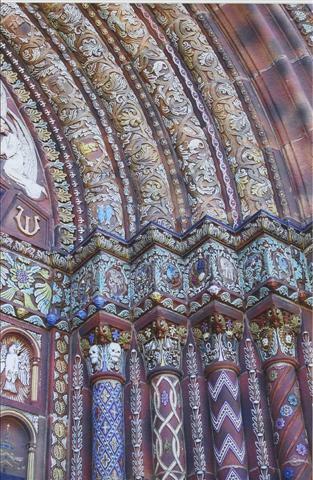 The herring-bone design on the exterior of the apse and the small designs within the exterior arches of the facade and nave are based on definite historical precedents. The common building material used on the windows, doorways, floors, columns and arches of the interior is terra cotta, which is employed for decorative as well as structural purposes. It is relatively inexpensive, is very plastic for modeling, offers great freedom to an artist, and it is very durable. 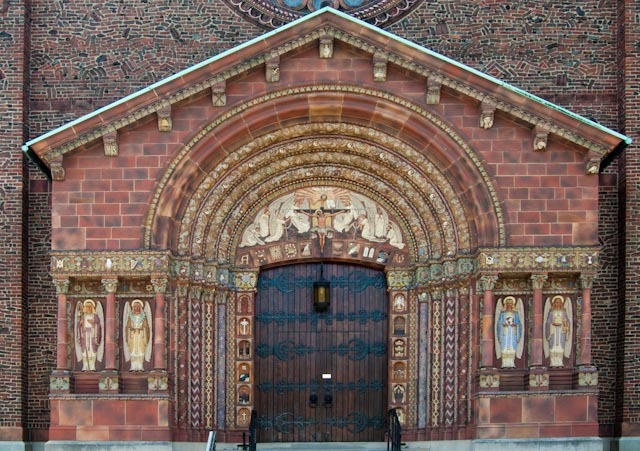 The ceramics at Blessed Trinity were made in Crum Lynne, Pennsylvania. All pieces were handmade, carefully fitted together, fired for two weeks, individually marked, and finally shipped to Buffalo. It took two men approximately two years to set all the ornamental pieces. 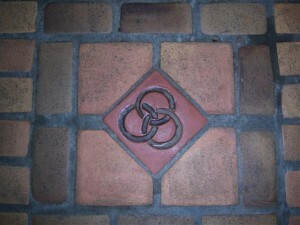 Most visitors to Blessed Trinity Church are astounded by the quantity and variety of symbols used throughout the structure. The architects asked the Rev. Thomas Plassmann, OFM, president of St. Bonaventure College, to work out a comprehensive plan of symbols for the church, similar to those used by medieval artisans. The symbols speak of nature (animals, reptiles, flora), science (rivers, winds, months (Signs of the Zodiac), seasons, arts, crafts, trades), history (the march of man from creation to the end of time), and morals (beliefs, virtues, vices, and the purpose of human life). In all, there are more than 2000 symbols and pictures spread throughout the building, the largest number of them appearing in the terracotta. Seen through its expansive iconography, Blessed Trinity Church presents a comprehensive view of Christianity. Because there are so many symbols involved in the fabric and decoration of the church, some visitors may feel overwhelmed with information and ideas. Therefore, it is recommended that persons wishing to understand and absorb the meaning of these artistic representations make repeated visits to the church, taking time to view and enjoy new discoveries each time they come. These symbols are, after all, a living link with a great medieval tradition of iconography in which the visible is often a vehicle for a deeper, spiritual truth.